This is the total number of pixels in a sensor. Five million pixels equals five megapixels or 5MP, which is the resolution of HoverCam T5 and Solo 5.. 8MP is the sensor resolution of HoverCam Solo 8. The HoverCam Solo 8 has an 8 megapixel sensor resolution and a 4:3 aspect ratio that is equivalent to the new 4K Ultra HD standard. The HoverCam Solo 8 has a 8.0 megapixel full sensor resolution and effective resolution of 8.0 megapixel. The HoverCam Solo 8 has an 8.0 megapixel sensor with an effective resolution of 8.0 megapixels. HoverCam Solo 8 allows you to capture true 8.0 megapixel still images using a 8.0MP sensor. 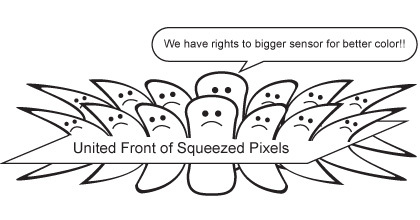 Sensor size is often a number manufacturers do not want you to know. When they cram many megapixels into a small physical silicone chip, each pixel is lower quality in terms of color. A lot of junk pixels crammed together result in a junk image. So look for a bigger sensor size. 1/6” is considered very small for even 2.0 megapixel. ½” is very big for a CMOS sensor. The Solo 8 sensor size is 1/3.2”, giving the pixels plenty of space for a high-quality image. Frame rate specifications should only be given together with resolution readings. For example, 30fps @ 1080P, 30fps @ 720P. The higher the resolution, the more difficult it is to achieve 30fps. When a vendor claims “Max 30fps”, the fact is most likely they can only achieve 30fps at a very low resolution, such as 640×480 (or 0.3MP). For document camera use, because you need to show small objects and text on a large screen, the lowest usable resolution is about 800×600. HoverCam Solo 8 is the only document camera that can deliver 8MP resolution, which is 4x better than 1080P, while maintaining 30fps lifelike motion. The Solo 8 image is so clear and beautiful. It pleases your eyes like a “pixels paradise”. 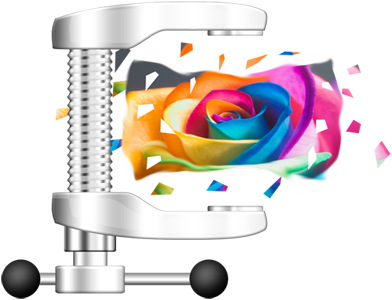 Video clarity and overall visual impression has a lot to do with whether the video is compressed or not. HoverCam Solo 8 is the only document camera in the market that can deliver YUV video at 8MP resolution @ 30fps over USB3.0. We discussed the impact of having more pixels, the size of sensors, frame rate and compression. The final image quality, however, depends also on other factors. These factors are, focusing, white balancing, exposure, lens shading, and color adjustment. You should be able to perform “select focus” or “touch focus” (when there is a touch screen), which means you can select a small region of interest within the whole field of view and make objects in that region to appear sharp. This is helpful when there are multiple 3D objects with different heights in the scene or when shooting at a thick open book. 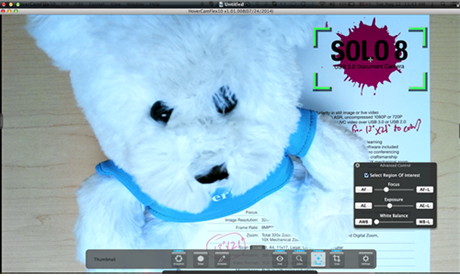 Solo 8 includes auto focus, auto focus lock and select focus functions. White balance is “the method by which digital cameras adjust the colors of a scene to accurately represent them. Because different sources of light — such as a candle versus sunlight — emit different colors of light, it’s important for the digital camera to adjust its color scheme to match human vision, which can interpret all whiteobjects as white, no matter what color of light they’re reflecting. Think of white balance as the base line for creating colors using a digital camera. 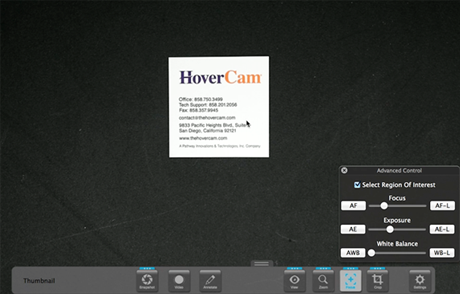 HoverCam has built-in software and hardware controls that allow you to auto white balance (AWB), manual white balance (MWB), and lock white balance (WB-L). You can also perform “Select WB” or “Touch WB”, which is a handy tool when the scene is composed of multiple objects with multiple colors. While the default full frame AWB takes the average of the whole scene, Select WB lets you accurately white balance on the object of the most interest. In the example of a small business card sitting on top of a dark background, such as a desk, auto exposure shows a totally over exposed business card. “Select Exposure” controls on the HoverCam Solo 8 can easily correct the exposure level by measuring exposure only of the business card, making the text appear clear. Optical Zoom: 90% of the time, people paid more than necessary for a document camera that looks “substantial”. What’s not known by most customers is that these expensive cameras look substantial due to the addition of an optical lens assembly with 6x to 12x telephoto zoom capability along with a control panel. – The manufacturing cost for adding the optical zoom capability and controls can double the retail price of the product. 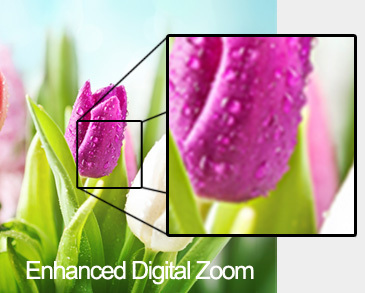 In the case of a high quality Austrian-based manufacturer, their opitical zoom capability can increase the camera cost by 10-fold. ASR Optical Equivalent Zoom. HoverCam has pioneered the patent-pending ASR Zoom technology which achieves the equivalent of 8x optical zoom. This eliminates the need for expensive and bulky lenses while making the zooming and panning operation highly responsive and easy to use. ASR stands for Adaptive Sensor Resolution. HoverCam is also developing a low-cost lightweight 10x optical lens accessory attachment for the Solo 8 for those users who require higher levels of magnification. HoverCam Enhanced Digital Zoom. HoverCam cameras all have a USB connection that allows the digital zoom to be performed on a PC or a Mac computer. 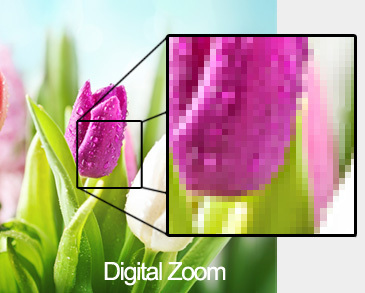 The processing power of a computer enhances the digitally enlarged pixels by applying certain “smoothing” type of image processing in real time. 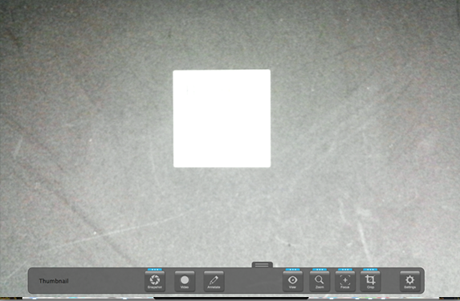 As a result, HoverCam’s digital zoom is far less pixilated and more eye pleasing. Secondly, the PC is a much better command and control center than the old styled video source switching on traditional document cameras.. 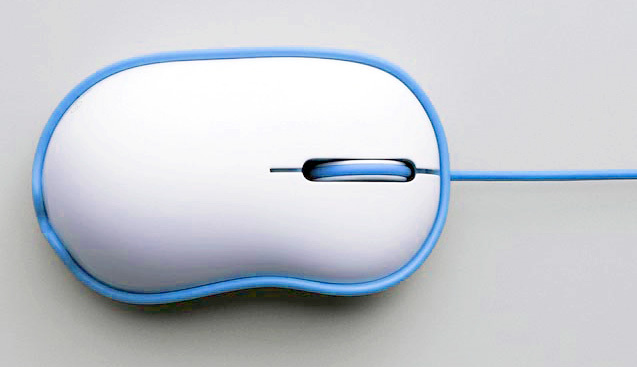 Switching the view from the camera to a PowerPoint or a website is as simple as a mouse click done seamlessly and instantaneously. 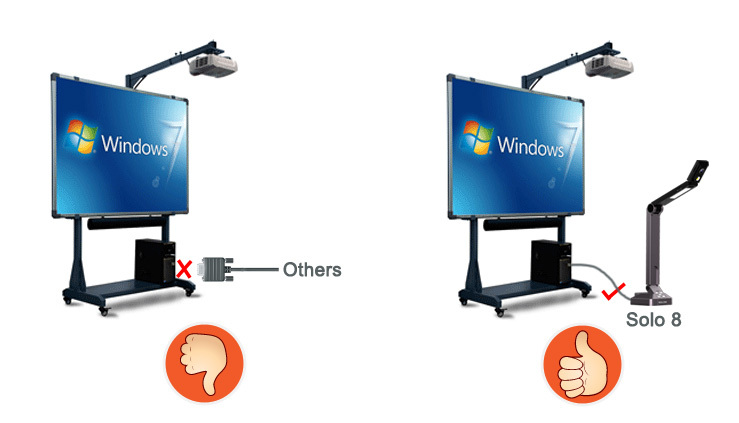 From HoverCam FlexView screen, you can drag still images and live video frames and drop them right into your office applications, such as PowerPoint, Word, and Excel, and even into interactive whiteboard software programs. HoverCam software and hardware work together to let you record in 1080P at 30fps or 720P at 30fps for 100s of hours without using up all your storage. 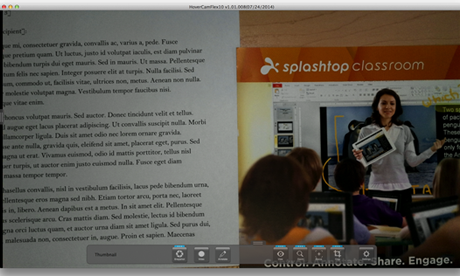 Even live annotation marks are captured along with audio and video, making HoverCam the most easy to use video recording tool for teachers. 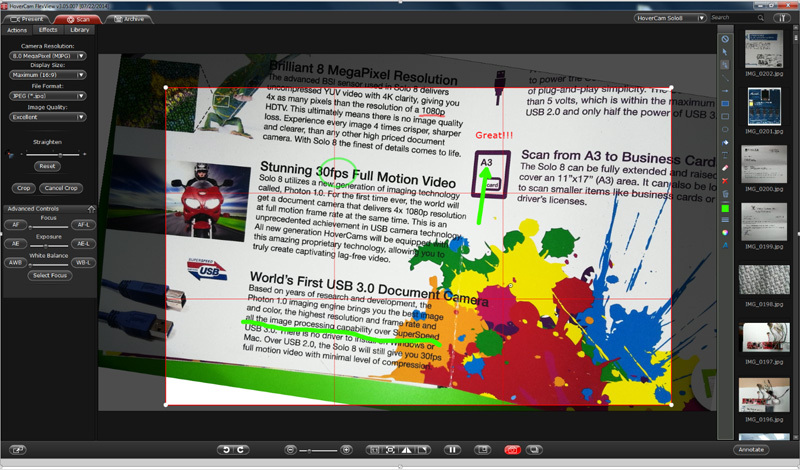 The limitations caused by low processing power of the embedded device used by the traditional document cameras goes away once a HoverCam is connected to a PC or Mac. 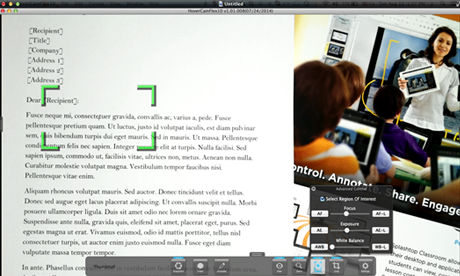 The full modern Graphical User Interface (GUI) on a computer makes annotation simple, easy, and even fun. HoverCam cameras, with the exception of Neo 3, are powered by a single USB cable with no external power required.